This afternoons trip with Scott Wischmeyer and his father from Indiana was a tough one. Scott started the action off by landing a nice Redfish that measured just a little bit to short. 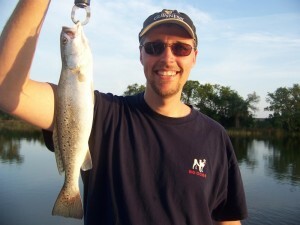 After a little action with some smaller Speckled Trout we began fishing the docks where the action started to increase. 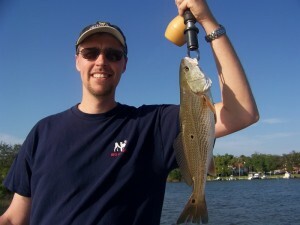 Over the course of our trip the guys did a great job catching fish but today just seemed to be “Short fish day”. As always i had a great time spending the evening with these two gentleman from Indiana. Being on the water and sharing stories with my clients is one of the things that i love most about guiding. With lightning in the distance we called it a night and headed for the ramp. 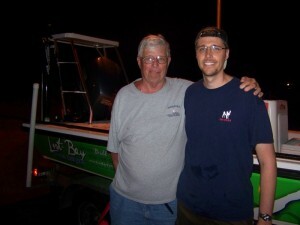 Scott, Thank you for referring Erik and Regan to Lost Bay Guide Service.